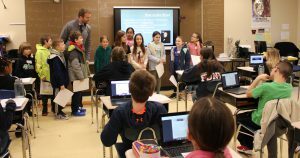 New and excited voices filled the hallways of Warwick Valley Middle School as Park Avenue Elementary School fourth-graders toured the new school they will be attending this fall. This March 18 visit was their first official opportunity to see where they would be spending the next four years of their academic careers. Middle and elementary school administrators want to ensure the transition process allows each student to become comfortable and knowledgeable about their new environment as early as possible. The National Education Association equally notes a key indicator of a successful middle school experience is a positive transition from elementary school. Visits like this are part of Warwick Valley’s comprehensive transition process involving all incoming students and parents. Sanfordville Elementary’s fourth graders will visit the middle school on March 28. 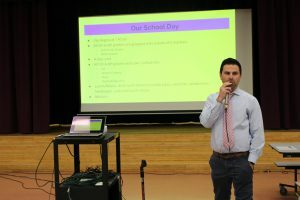 For the Park Avenue students, the first stop at the middle school was the cafetorium, where students were introduced to the daily school schedule they would be following next fall. They learned their school day will begin much earlier -7:40 a.m. They will have a two teacher team with one covering ELA and social studies and the second covering math and science. For some, the earlier start time caused some concern. Shea Smith also felt she might have a similar challenge, but it should be workable. Also new to students will be the A-B-C-D four-day cycle the school follows. They were also shown what a sample schedule looks like. And, they’ll have in-room “cubbies” for their belongings. Lockers will be assigned in seventh-grade. Students equally heard about bus schedules and were reminded to not worry about the high schoolers who would be on the bus with them. 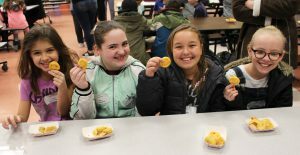 As they listened, students also had a chance to sample pizza bites, corn dogs and smiley potatoes, popular items off the lunch menu. “The food here is amazing,” said Anthony Fasolino, though he admitted he didn’t like the corn dogs. But Shea was quick to support Park Avenue’s food services staff. Shane also felt eating at the middle school was going to be wonderful experience. 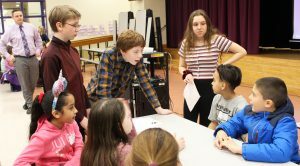 Later, members of the middle school’s National Junior Honor Society took the fourth-graders around the building and showed them classrooms and areas like the gym, arts, technology and music. Jenna Grady wondered if four minutes would be enough time to get from class to class. She later decided she could make it work. Anthony felt the tours gave him a good introduction to the layout of the building. The foursome felt taking the short ride over to the middle school was worth taking time away from their fourth-grade class time. They had very preliminary thoughts about what they thought the best thing about middle school could be. “The clubs,” Anthony said emphatically. “I get to go on the same bus as my sister,” said Jenna. Principal Sandra Wood said she heard some fourth-graders told their middle school hosts they didn’t want to leave Park Avenue.